There are so many wonderful factors involved with reading a print copy of the book. When I was in elementary school I remember the excitement of going to the bookstore with my mom to purchase more Magic Tree House and Junie B. Jones books. The feel of sitting down in the book store, perusing through various books and selecting which ones I wanted to read was just so much fun! Then, when I got home I could curl up on the couch and read for hours; and when I was done I could go back to the bookstore and purchase the next book in the series. Nowadays, I find myself going to the bookstore less frequently. I order paperback copies online, and have the books shipped to my house which is more convenient. But, I do miss the fun trips to the bookstore. Nevertheless – I think that reading paperback books has its own charm and excitement that cannot be replaced by an electronic book. Holding the physical copy of the book in my hands, and flipping each page makes the reading experience so much more real and memorable. For this reason, I personally prefer reading print copy books. On the other hand, e-books seem to be more convenient than print books. Purchasing an e-book can take place in a matter of seconds and these books are often priced less expensively than print copy books. 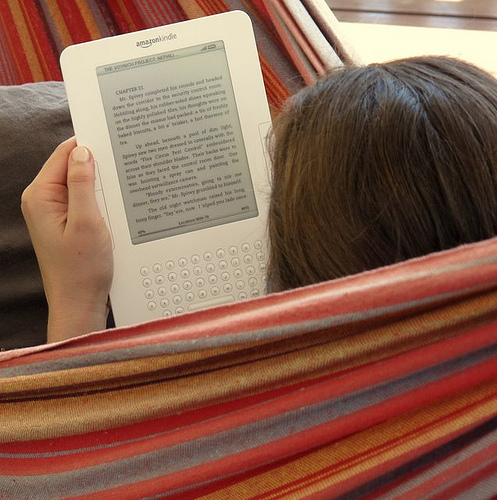 Then again, in order to read e-books one must have a particular device – tablet, iPad, Kindle or laptop to read it on. Thus, an additional payment has to be made in order to have access to e-books, whereas reading print copies does not involve any extra device. With e-books, there most likely isn’t going to be a storage problem, unless the device has a limit on how many books can be purchased. However, with print copies – one can easily run out of bookshelf space. I personally have books stackedall over the shelf in my office, in my room, and some stored in boxes. I just love being surrounded by all my books and occasionally find myself flipping through old copies and reminiscing all the exciting childhood memories (#bookworm). In the end, I believe it comes down to personal preference. Some people love the accessibility and inexpensiveness of e-books. Others enjoy the warmth involved with reading a good old-fashioned paperback copy. There’s no right or wrong option. Ultimately, the best part of having a book in the first place is reading it! And even though the world of e-books is rapidly becoming more prevalent – I do believe there will always be an opportunity to sit back, relax, and enjoy reading a nice paperback book. I’m interested in hearing what you think about print books versus e-books so please feel free to comment below and share your insight! I agree with you, it all comes down to personal preference, space, and convenience. I love both books and e-books; I just LOVE reading and books and e-books are perfect for my reading habit! I still enjoy extremely frequent trips to the bookstore, even if I’m just there to browse and kill time. I use the Goodreads app and scan all the books I’m interested in, I may never go back to that particular book store, but it helps me build my TBR list to insurmountable numbers (currently at 939 titles, which was last weeded through about 6 months ago *yikes!*). I can agree that it’s completely a preference, I have students that only read on their ereaders and others who fawn over a paper book. I for one prefer paper to electronic, even when reviewing for others. My 9-year-old son will only read physical books. I have tried to get him to read e-books, but he is devoted to print! I on the other hand enjoy both, but I do find myself reading more/faster with e-books. Not sure why though. Thank you for your insights into this topic! I personally prefer print books unless I’m on vacation and then I load up on ebooks. I recently did an informal survey with the 5th grade students at my school and they overwhelmingly preferred print over electronic. I must admit, I prefer eBooks over print (I know, I’ve been seduced by the “dark side”). But seriously, I just love the convenience of it all, and know that I can access countless of books on my Oyster account (I do not work for Oyster…but they should employ me with all of the people I’ve gifted with Oyster subscriptions!). While I used to be the ones that ranted against the evils of technology and how it was going to kill libraries, I feel that it has done the opposite. Libraries have evolved with the times and have had to reevaluate how they delivered services and “sold” reading for fun for youth. I feel that with the advent of eBooks, we have and will continue to experience a boom in reading.